Made of elegant navy blue velvet, this challah cover symbolizes greeting the sacred beauty of the holy day of Shabbat. 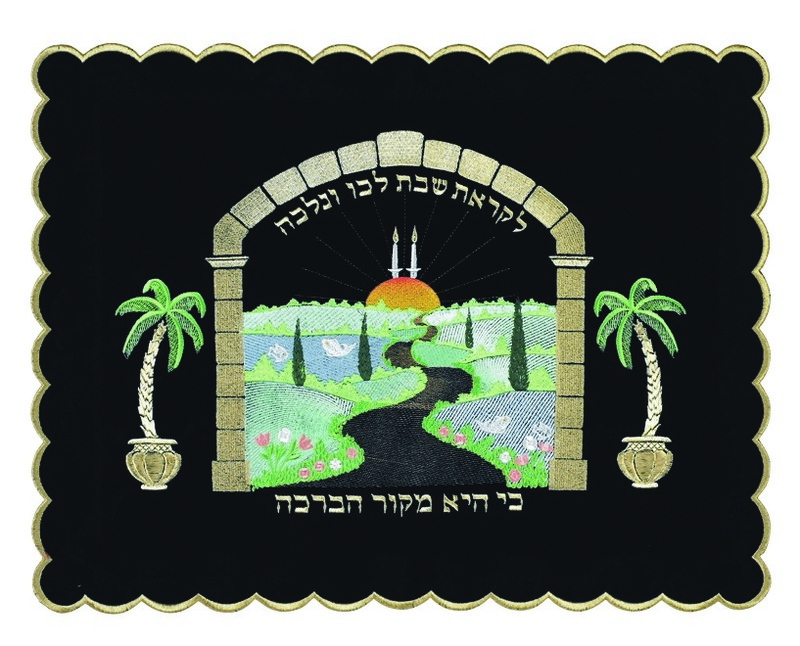 Based in a stone archway, embroidered with gold colored thread, a beautiful and colorful scene of the arrival of Shabbat is masterfully depicted. A stone cobbled path snakes through the plush landscape filled with green grass, trees, flowers and water. At the end of the trail the sun is setting with two lit candlesticks, indicating the imminent arrival of the holy day of Shabbat. The design is flanked by colored palm trees on each side. The Hebrew words from the Lecha Dodi medley are embroidered on the challah cover, expressing the message of the image. On the top of the picture the Hebrew words “Lickrat Shabbat lechhu v'nelechhah”, which means “Towards the Shabbat let us go and travel”, on the bottom of the picture, the Hebrew verse continues, “ki hi mackor haberachah”, “For it is the wellspring of blessing”. The edges are trimmed with gold thread in a scalloped design.